Miscible with dioxane, terahydrofuran, dimethyl formamide, polar and aprotic organic solvents. TP3 is an exceptional reagent for amide/peptide bond formation. The product is very easy to use and combines excellent reaction selectivity, low epimerization, high yields and high product purities. Conversions of acids and amides to nitriles under mild conditions. 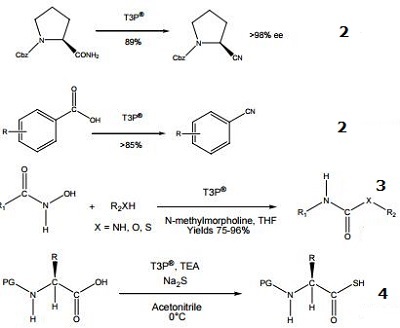 Synthesis of urea and carbamate derivatives. Formation of thioacids from N-protected amino acids and peptides. It is employed as an efficient promoter for the Lossen rearrangement to synthesis urea and carbamate derivatives.